The weather phenomenon known as La Niña is having wide-ranging impacts around the Pacific basin, as Colombia copes with record rains and New Zealand swelters through a heat wave. The El Niño Southern Oscillation (ENSO) climate pattern is a coupled ocean-atmosphere phenomenon consisting of El Niño and La Niña cycles. This year is being classified as a moderate-to-strong La Niña, following 2009’s especially intense El Niño year. La Niña is characterized by colder-than-normal water currents along the Pacific coast of the Western Hemisphere, which led to a severe rainy season from May through November in Mexico, Central America, and the northern part of South America. According to the United Nations Environmental Programme, although ENSO is naturally occurring, a warming climate may contribute to an increase in the frequency and intensity of El Niño cycles. La Niña cycles double the likelihood of intense weather, such as hurricanes and tropical storms, for much of the Caribbean and the Gulf of Mexico. In November, rainfall in the Caribbean was five times the average of 2 inches and in the central highlands of Colombia, rainfall was more than double the average of 3.5 inches. In Colombia, this year’s rainy season—the worst in 42 years—has been exceedingly severe, with close to 300 deaths and more than 2 million people affected over the last two months, according to the BBC. More than 20,000 homes have been damaged and nearly 2,000 completely destroyed, according to AccuWeather. Nearly a quarter of the nation’s paved roads have been damaged or destroyed and more than 41,000 cattle have been lost, reported the Associated Press. With close to 2.5 million acres of farmland and over 600 schools under water, the damage in Colombia is estimated at $5 billion. The constant moisture has also led to a fungus outbreak infecting more than half of the nation’s coffee crop. Additionally, nearly five percent of the rice crop and 10 percent of the sugar crop have been lost. Banana production has also been interrupted, with neighboring Ecuador “filling the gaps” in international supply, according to Fresh Fruit Portal. With close to 2.5 million acres of farmland and over 600 schools under water, the damage in Colombia is estimated at $5 billion. The United States, the European Union, North Korea, and Switzerland have pledged more than $20 million in aid. After visiting neighbor Venezuela, which has also had particularly severe flooding this winter, the Ecuadorian president visited Colombia and vowed to help, thus restoring diplomatic relations, which have been strained since Colombia’s 2008 military raid on a clandestine Colombian guerrilla camp just inside Ecuadorian territory. Earlier this month, the Colombian president declared a state of emergency, which allows the government to employ emergency loans and taxes to raise disaster relief funds. The floods are troubling the Colombian economy, as well, and could lead to inflation and escalated food prices—already, the price of bananas has tripled from $5.40 per box to $16.40. The peso, which has performed the worst among 25 emerging-market currencies tracked by Bloomberg, dropped 5.5 percent over the past three months. Colombia typically has two rainy seasons, the first from April through June and the second from October through December, but officials fear that the La Niña boost will translate to the rains persisting through February. Lack of infrastructure is the number one problem associated with flooding in Venezuela, a nation which hasn’t seen extreme floods since December of 1999. In the last three weeks, flooding has claimed the lives of 25 Venezuelans and the homes of more than 100,000, according to the BBC. The total damage is estimated around $10 billion. President Hugo Chavez has declared a state of emergency for the capital city of Caracas and three northern states—Miranda, Vargas, and Falcon. Schools have been canceled and hundreds of shelters have been opened. But the government is encountering difficulty with relocating citizens from their homes in at-risk, hillside shanty towns to relief shelters, which are already overcrowded. Even President Chavez is housing 25 flood-refugee families in his palace. Some hotels and government offices are housing flood victims, along with the Venezuelan Foreign Ministry. Even President Chavez is housing 25 families in his palace, according to Reuters. The National Assembly has said that the parliament building could also be used as a refuge. For the long term, Chavez plans to have new houses built for the refugees on private lands that will be sequestered by the government. Venezuela has also made arrangements with Brazil for military bridge-building equipment, to replace bridges that have been destroyed by the floods. Argentina, Bolivia, Nicaragua, and Ecuador have also offered aid to Venezuela, in addition to a $100 million donation authorized by the Andean Development Corporation. “We have brought cooking oil, lentils, rice, red beans, powdered milk,” said Rafael Correa, president of Ecuador, who brought Venezuela 11.2 tons of humanitarian aid, according to Fox News. Venezuela’s economy depends on oil exports, and two of the nation’s largest refineries—which, combined, produce nearly a million barrels per day—were shut down temporarily due to a power failure, according to Reuters. Nearby, the flooding also caused a small spill. In the United States, La Niña is being credited—or blamed—for a similar range of weather. La Niña tends to result in drier and warmer conditions across much of the southern tier of the United States and wetter weather across the Midwest, Pacific Northwest, and the Northern Rockies, according to the National Oceanographic and Atmospheric Administration (NOAA). The flip side of the weather pattern, El Niño, occurs when water temperatures in the equatorial Pacific are warmer than average and results in nearly the opposite effects. Earlier this month, temperatures in Colorado Springs, Colorado hovered near a record high of 65 degrees and snowfall was well below normal, according to the Colorado Springs Gazette. The weather pattern stood in stark contrast to last year’s El Niño event, which inspired blankets of snow and single-digit temperatures. La Niña could exacerbate drought-like conditions that have been plaguing parts of Arizona and northern Mexico for the past decade, according to the Climate Assessment for the Southwest (CLIMAS) program, a division of the University of Arizona Institute for the Environment. Already this year, snowfall has been low in Arizona and New Mexico, while the Northern Rockies and the Uinta Mountains, which provide water to the Colorado River, have received early winter storms and snow. Earlier this month, CLIMAS launched the La Niña Drought Tracker, an online monthly publication featuring information on current and future drought conditions. 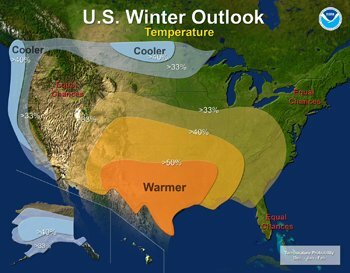 2010 U.S. winter outlook, given La Niña weather conditions. Increased precipitation and cold weather in the Pacific Northwest, with warm and dry conditions in the Southwest. The Southwest is expected to be dry through May, with the highest chance of dry conditions between February and April. And a dry winter corresponds with increased risk of wildfires in the spring, since river flows will be lower. Leftover brush from last year’s relatively quiet wildfire season could also prove problematic, especially since there is an overabundance of it thanks to last year’s wet El Niño winter, according to ABC News. Meanwhile, the coast of Washington state has experienced high winds and 30- to 35-foot surf in late October, followed by extremely low temperatures in late November due to La Niña. NOAA has predicted that the trend will continue, with one major weather event every month through April 2011. This may include above-average precipitation and colder-than-average temperatures during the winter in the the Cascade and Olympic mountains, followed by spring flooding when rains boost snowmelt and raise river levels. Aubrey Ann Parker and Steve Kellman contributed to this reporting. Reach them at circleofblue.org/contact. is a Traverse City-based assistant editor for Circle of Blue. She specializes in data visualization.